If you live in the Midwest like I do, you know that we are in the middle of an unreal string of amazing weather-- temperatures in the low 70's, sunshine, light breeze, and every ounce of my being is shouting, "SPRING!". I wholly welcome this shift because it is at this time that I always feel invigorated and drawn to get out of the house, exercise more, and get my oversized rear off the sofa. Monday night was my last "hurrah". I celebrated the unofficial end of winter by camping out in front of the television and numbing my brain with the official end of The Bachelor. Now before you judge me for my choices, let's put things into perspective. I don't go out drinking, I don't wear revealing clothing and I certainly don't abuse or otherwise mistreat my children, so I think that spending two hours out of my week watching a greasy-haired man make truly appalling dating choices is acceptable, even necessary. All mothers of high-maintenance children need a break, and if I am able to find respite in poor quality reality television and not in illicit drugs, more power to me. For those of you unfamiliar with the Bachelor, let me give you a very brief and formulaic synopsis: One man (Ben) goes on weekly dates to slowly and painfully lead on and eventually, emotionally scar twenty-some women, until he has narrowed the pool down to two. Throughout the process, otherwise intelligent women are led to make statements like, "You know, jumping off of a cliff (or into a crater, or out of a plane) is kind of like a relationship. You simply have to trust that your partner will be there for you to catch you when you fall." 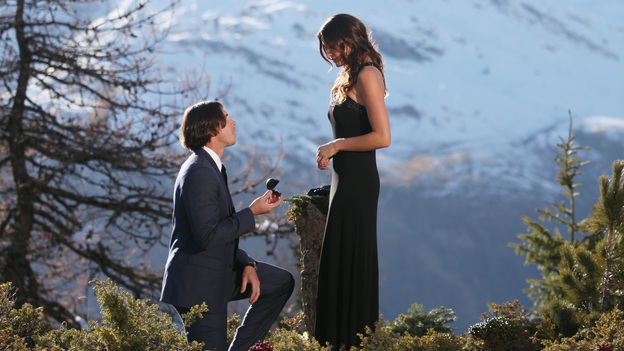 This season, Ben chose and proposed to Courtney, the "Black Widow"-- a manipulative and unlikeable woman, but a model and therefore prettier enough to overlook her character flaws. After the finale show was over, we were subjected to an additional hour of follow-up programming to confirm that she is, indeed, manipulative and unlikeable. I turned off the television and felt, more than ever, that as the seasons have shifted, I too, am ready to usher in a new phase of the year. So the next day, I went for a walk. I saw tulips leaping out of the ground and kids playing hopscotch. (I thought maybe I'd slipped into a wormhole and back to 1986, but it was still 2012. Who knew.) I saw so many things, in fact, that I remembered how entertaining life can be when the reality television finally gets switched off and the real life gets switched back on. Not "The Real World". Real life. Take, for example, the group of five or six 10 year-olds in the park passing around a can of pop. It reminded me of when I was little and my friends and I would stop by the local bar to buy bottles of orange or purple soda and drink them on the sidewalk as the sun baked our shoulders. I smiled fondly until later when I thought more about it and realized that the kids were drinking an ancient Zima. Even that was funny until a quick search on my phone revealed that Zima was not alcohol-free as I'd always thought. 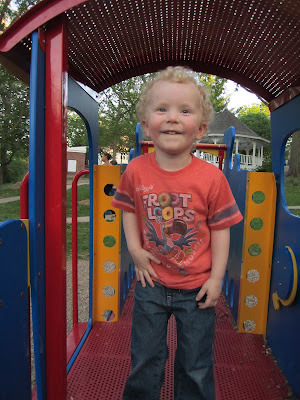 When I'd completed my loop, however, the youthful boozers were gone and the only sounds in the park were my own feet clomping along on the pavement. Clomp, clomp, clomp... THWAP! The sidewalk that was serving as my track was covered in tiny pebbles from the playground, thrown from their intended location by sugar-riddled children jumping and climbing on the train-shaped equipment, or maybe launched by pre-teen boys in a semi-alcohol induced daze. Either way, my Nikes couldn't find traction on the tiny stones and I slid, nearly wiped out, and even slammed hip-first into a parked car. Karma for not chewing out the Zima boys? Perhaps. But it definitely put a slight damper on my walk about town. I was embarrassed, a little sore, and longing for a cold drink and the couch when I saw him. Or her. I don't really know. Regardless of gender, it was clear that I had encountered the laziest and most winter-drained squirrel in the entire state of Iowa. First of all, he was the size of a football, and similarly shaped. 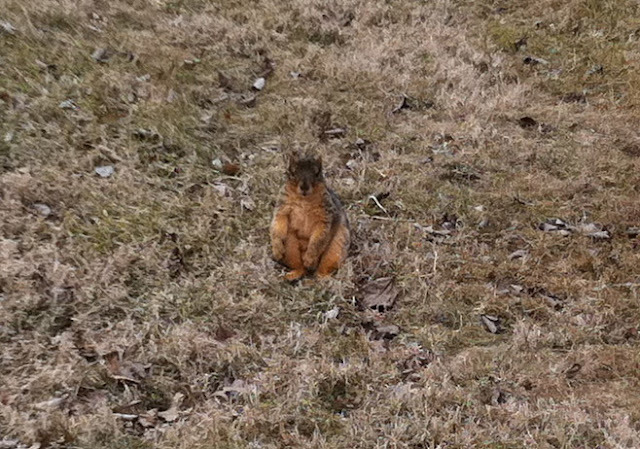 But the best part was his posture, the squirrel sitting in a human-like position. Not legs crossed, or on his side, instead this rodent was sitting upright but slouched, not unlike the position I take as I settle in for a Bachelor fix every Monday night. He was so subdued that I inched closer and closer to him to snap a photo until, at only two or three feet away, he finally waddled over to a nearby stump and collapsed against it. When I returned home, I was left to ponder the strangeness that was my afternoon walk. What were the odds that I'd experience all of those strange happenings in one day? But you know, kids drinking Zima (or walking into a parked car, or disrupting a squirrel in a blasé mood) is kind of like life. You simply have to trust that at the end of the day, you'll still have the motivation to just keep walking. Until May, that is. Everyone ready for the Bachelorette?